This workout is an entry in our annual Bootcamp Ideas competition from Valerie Stewart. Functional Strength and Power…Oh My! Pilates leg series including 30 seconds of each, on back. Depending on size 2 – 4 people in each station. Do each exercise for 50 seconds with a 10 second break, single leg moves 25 secs per leg. Modifying with lighter weight. break when needed. 3 times through. Big pause after each rotation. Rest at end before moving on. Due to the intensity of these moves. Do each for 20 seconds with 10 second break. straight through 2 sets (Tabata style). Staggering members to start 2 to 4 at each station to use less equipment and rotate through. After 1st Tabata break for 2 minutes then repeat. Squat curl press with dumb bells. Plank series. 30 sec each. I am the group fitness manager and certified personal trainer at Duvall Fitness. 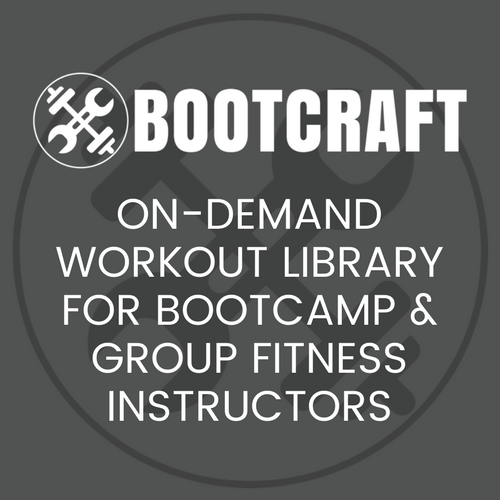 I teach 3 bootcamps per week. Depending on weather, because Duvall is in Western Washington where it is not always warm and sunny, we meet indoors AND outdoors. This workout is an indoor circuit.